From the abstract: The lone star tick, Amblyomma americanum, is a vector of Ehrlichia chaffeensis and E. ewingii, causal agents of human ehrlichiosis, and has demonstrated marked geographic expansion in recent years. A. americanum ticks often outnumber the vector of Lyme disease, Ixodes scapularis, where both ticks are sympatric, yet cases of Lyme disease far exceed ehrlichiosis cases. We quantified the risk for ehrlichiosis relative to Lyme disease by using relative tick encounter frequencies and infection rates for these 2 species in Monmouth County, New Jersey, USA. 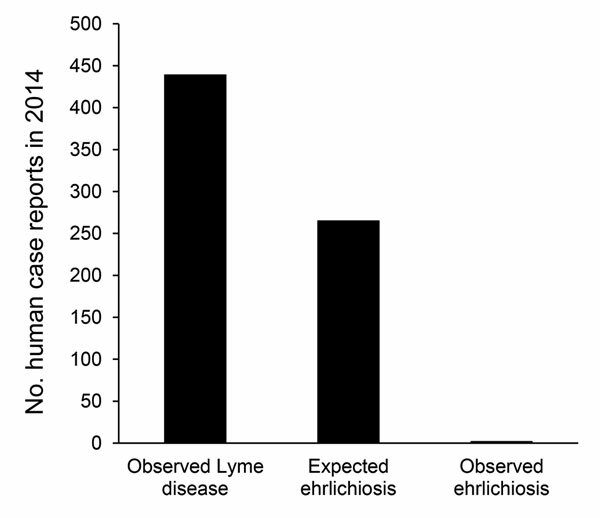 Our calculations predict >1 ehrlichiosis case for every 2 Lyme disease cases, >2 orders of magnitude higher than current case rates (e.g., 2 ehrlichiosis versus 439 Lyme disease cases in 2014). This result implies ehrlichiosis is grossly underreported (or misreported) or that many infections are asymptomatic. We recommend expansion of tickborne disease education in the Northeast United States to include human health risks posed by A. americanum ticks. Read more here at EID ! NOTE: There is a Continuing Medical Education (CME) credit available (1.00 AMA PRA Category 1 ) upon participation in activity with this article. See the first page of the article for more information. This entry was posted in Uncategorized on May 19, 2017 by Lisa Reed.